Nowadays cauliflowers are available round the year, but there was a time when cauliflowers entered the market only in winter. Besides cauliflowers, there was an array of other vegetables sold in the market on winter months only, such as peas, carrots, beetroots and so on and so forth. Cauliflower and green peas are two of my favourite vegetables. At a time when my fussiness over eating veggies would test my mother's forbearance in the face of my tantrums, I never gave my mother any trouble for eating cauliflower and green peas. 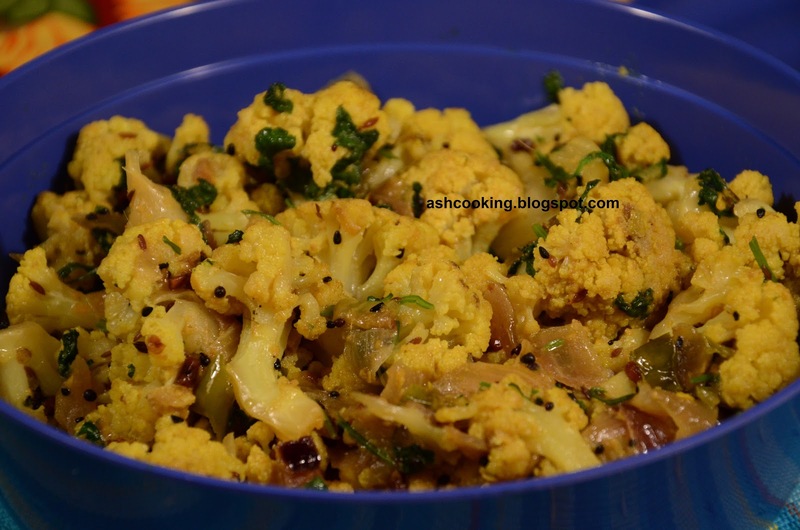 My mother's favourite cauliflower concoction was "Phulkopir Dalna" the recipe of which I would post sometime soon, but there was this simple dry cauliflower curry that I liked best with rotis. 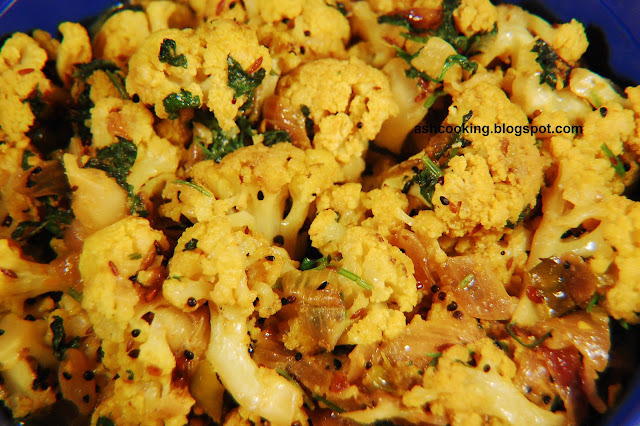 1) Blanch the cauliflower in microwave for 8 minutes. Drain the water and pat cauliflower dry. 2) Heat oil in a wok. Add the ingredients for sauté when oil turns hot allowing them to crackle. 3) Add onion and fry till onion turns translucent. Add turmeric powder, cumin powder, green chillies and salt. Sauté the spices for 1 minute. Dung cauliflowers in. Stirring occasionally, on medium heat, cook the cauliflower for 5 minutes. 4) Add yogurt and mix in. Cook on medium heat until cauliflower becomes tender. 5) Garnish with chopped coriander leaves. Serve hot with roti or chapati.